Don’t miss Jaimee Hannah’s editorial about life and The Simpsons. When I heard that FXX would be hosting a record-breaking Simpsons marathon August 21 through September 1, I was excited that there would be one channel – one lone channel in the lineup of hundreds that we pay entirely too much for – that would have something good on it at all times. I didn’t, however, think that I would fall back under the spell of The Simpsons and spend so much of my spare time sitting on my couch, laughing at episodes that I have seen so many times. The Simpsons has always been consistently good, regardless of what else is happening in the television landscape. I had loved watching the shorts that aired on the Tracey Ullman Show, so I was a huge fan of The Simpsons from the very beginning. Like a lot of other parents, my mom and dad spent entirely too much time bemoaning how bratty and terrible Bart was and what an awful example he was setting for young people. I wasn’t interested in Bart though. I thought he was funny, but he was pretty terrible and I was mature enough to know that I didn’t want to act like him. Lisa, on the other hand, was teaching me a lot of important things about life, and she was a positive influence on me and other young viewers. 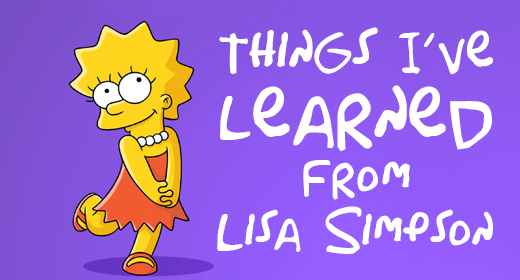 Of the many lessons I learned from Lisa when I was a kid, the following three made the biggest impact on who I am today. 1. Don’t be afraid to be who you are. Lisa had something that I, along with many young girls my age, lacked: confidence. Over the course of several seasons, Lisa becomes a vegetarian, a Buddhist, a musician, and a member of MENSA. One of the best things about watching Lisa adopt and support the principles that defined her was that she made it look easy, which made me feel like I could do it, too. I would eventually settle into my own roles, not all of which my family accepted, some that my friends thought were weird, and several that I look back on now and wonder what in the world I was thinking. Because Lisa showed me how to be brave and true to myself, I’ve been able to embrace these different things and be comfortable with who I am. There was a lot of girl power talk in the early 1990s, but Lisa Simpson’s made the biggest impression on me. In the episode “Lisa vs Malibu Stacy”, Lisa is devastated when she is finally able to buy the new talking Malibu Stacy doll and it says things such as, “I wish they taught shopping in school!” and “Don’t ask me, I’m just a girl.” Lisa’s plan to thwart this injustice? Make her own doll (with the creator of Malibu Stacy, no less) that also talked, but said inspiring and encouraging phrases. All girls will have to deal with sexism at some point in their lives, and Lisa showed us that our actions are as important as our words when we decide to no longer tolerate this behavior in others. 3. Sometimes our family will disappoint us, but that doesn’t mean we’ll stop loving them. In “Lisa’s Substitute”, Lisa finally has a teacher who both appreciates and challenges her intellect, and he teaches her to be confident in who she is. However, Mr. Bergstrom is only a substitute, and he moves on to another job once Lisa’s regular teacher returns. This episode shows how much Homer simply doesn’t understand Lisa or what she needs from a father figure. This scenario mimics a lot of real life father-daughter relationships and how they change when daughters start to grow into young women and dads don’t know what to do (except stand at a safe distance from all of the hormones and emotions being slung around). We all remember how embarrassing our parents could be, and how it seemed like it was even worse when they were in the presence of someone we were trying to impress. We just have to love each other through it and hope that things get better as everyone gets older. The Simpsons is still as important and relevant to pop culture as it was when it debuted in 1989. With the success of the “Every Simpsons Ever” marathon, FXX has announced a fall schedule saturated with Simpsons episodes. New viewers will have many opportunities each week to watch the show, so hopefully Lisa will be making a positive impact on young girls today just as she did on me all those years ago. Don’t miss the latest episode of the JustUs Geeks Podcast! Don’t forget to Like Us On Facebook and to follow us on Twitter! A Simpson Separation? Al Jean Says Yes! Eric Plunk liked this on Facebook. Corey Hannah liked this on Facebook. Meagan Rikard Haney liked this on Facebook. Nyayu Nur Intan liked this on Facebook. © Copyright JustUsGeeks. All rights reserved.